Written on November 15, 2016 . Posted in Announcements + Updates, Fine Arts. Mary Jones (Senior Critic, Painting) has a new exhibition entitled Proxima B currently on view at the John Molloy Gallery (49 E. 78th Street, New York) until 26th November 2016. The Proxima b of the exhibition’s title refers to a newly discovered planet visible to us only from wobbles of color that portend the possibility of life. 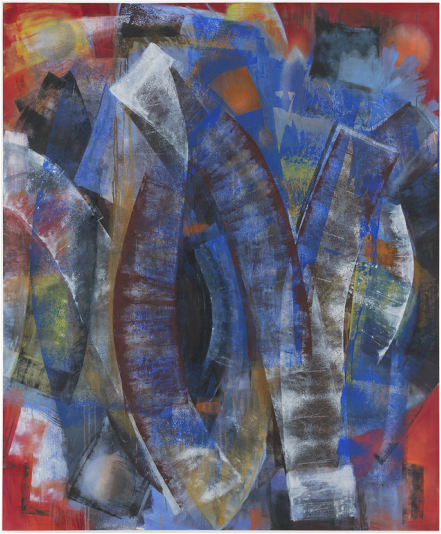 Mary Jones uses this title as a metaphor for her new abstract paintings, a way to describe this optimistic possibility, which in her painting might be the tension between improvisation and craft. Using bright, bold colors, the paintings vividly enmesh multiple layers and directions. The paintings are made through an interplay of constructive and destructive means, and with a variety of tools and materials. Jones begins with pouring, sanding, and brushing the canvas, and ends working over the surface with a paint roller, which simultaneously covers and exposes notions of gesture, and traces an archaeology through movement. In new collaged paintings, repurposed stencils from the artist’s studio or bits of feathered wallpaper place organic and sculptural forms in balance. The results are a beautiful blend of abstraction and representation. New explorations, as it were, to places and planets which speak to the idea of possibility.